This beautiful 1964 Shelby 289 Cobra was the biggest hit at a recent classic car auction held in Burbank, California by Auctions America. The company’s first foray into Southern California was memorable, with almost 400 automobiles sold along with some amazing motorcycles and memorabilia. The auction generated more than $17.2 million* in total sales with nearly 84 percent of all lots sold. 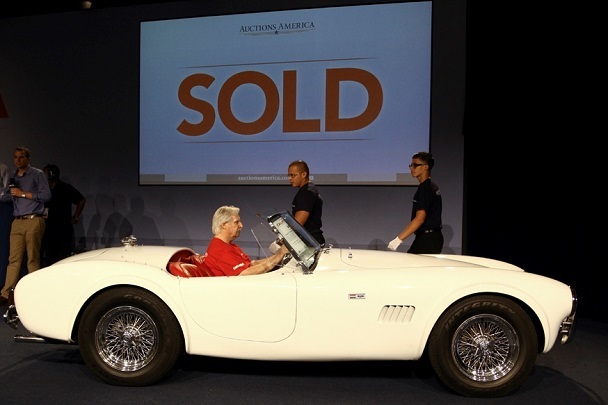 The Cobra fetched the highest price at $825,000. The Cobra featured a rare C-4 automatic transmission that was included in less than 20 vehicles. The notion of producing a hybrid sports car in the 1960s was, at its core, quite simple. While British manufacturers retained the edge in styling, road holding and superb braking, American firms held a distinct horsepower advantage. This “best of both worlds” concept was, of course, nothing new. Post-war Allards, Cunninghams, and Nash-Healeys used the same basic premise. 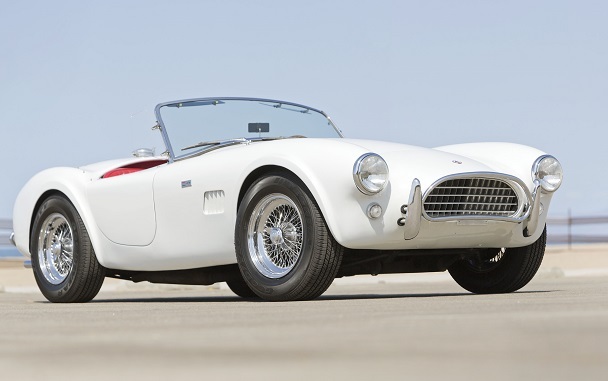 Carroll Shelby, however, considered chassis’ from Austin-Healey, Jensen and Bristol before settling on AC, after hearing that the builders of the stylish and sturdy Ace had lost their engine supplier when Bristol ceased production. Read more about the Shelby here. Steve McQueen’s 1946 Indian Chief motorcycle sold for $143,750, exceeding the initial estimates of $75-125,000. The event drew thousands of attendees from across the country over a three-day period and aired live for two days on NBC Sports Network with color commentary from famous car collector Jay Leno. If you love classic cars, you should definitely keep an eye on Auctions America.